In March 2012, director Maria Luisa Gambale showed the film to an audience of high school leaders from Tijuana in San Diego, California. They had such amazing reactions and comments afterward that she suggested they make a short video for Sister Fa, and they ended up making this very beautiful piece. 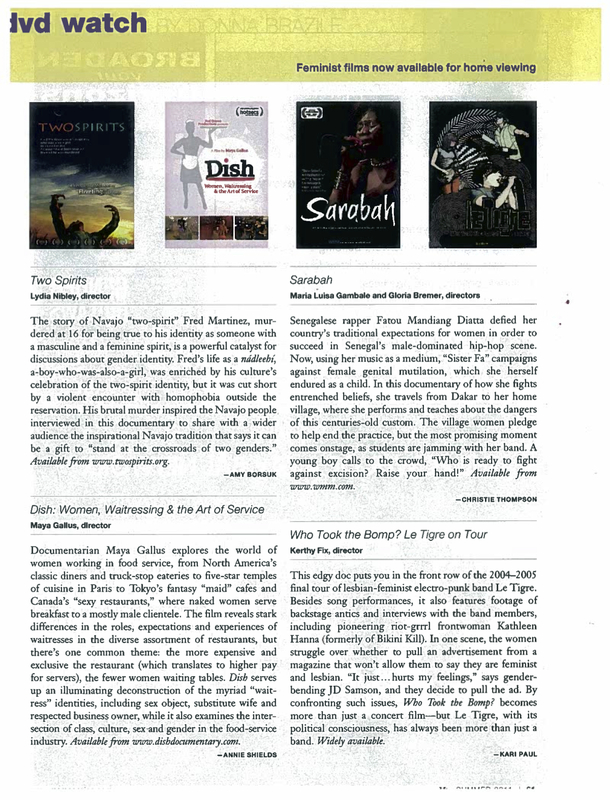 At the Montreal International Black Film Festival – where SARABAH won Best Mid-Length Documentary – audience members shared a few positive thoughts about the movie and about Sister Fa. Sarabah follows the life of Senegalese rapper Fatou Mandiang Diatta, better known as Sister Fa, and her quest to address female genital mutilation (FGM)* in her village in Senegal. After releasing her first album and marrying a German PhD student, she found herself in Germany working on her music and wanting to commit to raising awareness of FGM in Senegal, as she herself had undergone the procedure as a child. Sister Fa’s organization, Education Sans Excision, works with the NGO Tostan in advocating for ending the practice. I looked at how Tostan was portrayed in Nicholas Kristof and Sheryll WuDunn’s Half the Sky a couple of years ago, and noted the lack of African women’s perspectives on FGM in the book. Sarabah offers an important personal perspective from a thoughtful, talented African woman. When she returns to her village in Senegal with her German band, Sister Fa relates how the practice has little to do with Islam. Her village was one of the last to convert to the religion and retains cultural practices that predate their conversion. Imams might speak for or against the practice according to their own convictions, but it is ultimately women themselves who make the decision for their daughters to undergo the procedure due to its social convention. Sister Fa is aware of her outsider status as a German resident, and fears being perceived as such as she promotes her anti-FGM campaign in Senegal. This discussion is an ever-important one in the field of development—who has the authority to conduct advocacy against harmful social practices? And also: what role might those who have left their countries have to play in promoting wide-scale social change back home? What role do artists play in activism? I was not expecting these points to come up in the film, and found them refreshing to hear from Sister Fa herself. In a memorable scene from the film, she is at a primary school near her village, where she engages with students to discuss what FGM is, why it is practiced, and how it is harmful to women’s health. At the end of their discussion, they sing a song alongside musicians from Sister Fa’s band against excision in their communities. While she also engages in discussion with elderly women in her village, I found it encouraging to see children – both young men and women – having these frank discussions in the same room and later advocating for ending the practice. *The language around FGM is often politically charged. See this post for an earlier discussion about it on MMW. In August of 2011, Producers Maria Luisa Gambale and Steven Lawrence brought the film to Global Kids in Manhattan where a wonderful group of about 15 teenagers watched the film. It was our first screening with teenagers in the U.S. and we were blown away by their receptiveness to the subject matter, their admiration for Sister Fa and their many thoughtful responses. Check out the next generation of activists in this short video edited by Melinda “Pinecone” Tenenzapf, the next generation of awesome filmmakers. 1. What did you learn from the “Sarabah” that you didn’t know before? I learned about Sister Fa’s approach to the subject. She is very gentle, and makes it about education, not judgment. She is also very persistent. She has such love for her community in Africa. With education and caring you can change the practices. 2. What are the 2-3 most memorable moments for you in the film? The first was when she was on the radio and a male caller was verbally attacking her. I still don’t think that I understand the male perspective of this. Another moment was when she had the children in the schools singing about FGC. I know that is how things are communicated in a lot of parts of Africa. I could just see all the children at the CRC singing her songs. 3. Has the film inspired you to take action of any kind? I don’t think there is any question that we should take some action. More needs to be done. We just have to figure out the best way to help educate people. 4. Why do you think it’s the women in Sister Fa’s village who make the decisions about cutting? Why do you think the men don’t oppose it? I think that is the case in most places. It is seen as a traditional initiation into womanhood. They are also concerned about the future of their daughters and think they are doing the right thing to insure marriage for them. I don’t think the men or women understand the ramifications of infection, scarring, child birth and the complications. It has been the tradition for so long. They say one of the reasons is to keep women from wondering from their marriage. Of course men would support that. 5. Do you think Sister Fa’s “Education Without Excision” campaign is a good way to convince people to abandon FGC? Please explain why or why not. I think that once people are educated they can make better decisions about whether or not to continue FGC. I think if they really understand the complications it will help. Though I think there will still be some that will not change their practices until not being cut is more of the norm. 6. Is it a good idea for schools to teach children about the dangers of FGC? Please explain why or why not. 7. What else could Sister Fa do to promote change? Be present in more villages all over Africa. Continue to write music to educate. There are so many traditional languages, I don’t know how to reach a bigger audience. Work with more NGO’s to help spread the word. 8. Are there musicians and other celebrities in Sierra Leone who could do something similar to what Sister Fa is doing? Who are they? How would you convince them to take action? I don’t know the musicians and celebrities in SL. We would need to do some research. 9. Please tell us your overall reaction to “Sarabah”. I think it is very moving. I love her approach to a difficult subject. She has an incredible message to spread and she does a wonderful job of reaching out to people. She can speak as someone who has been there. 10. Please tell us your overall reaction to Sister Fa’s music. I love her music. I did have some trouble understanding some of the word even when they were in English. I just have to work on listening to the accents.